What a week it's been! And sadly, I don't mean that in a good sense. Earlier this week, I got struck with food poisoning (bad case of potato salad from Graul's), so I've been out of commission until today. I thought perhaps I was getting better yesterday, but nope, it decided to stick around for another day. My brother-in-law and I were the lucky ones though, because my mother-in-law has been hospitalized from being food poisoned since Wednesday! Please say a prayer for her, we're hoping she gets out of the hospital asap and recovers quickly. 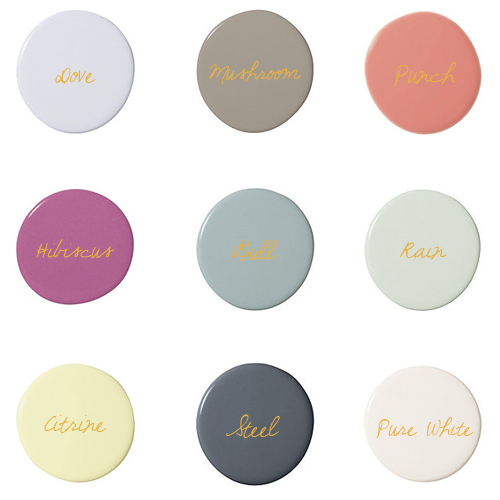 While I was sick in bed, I got an email from Serena & Lily showcasing their paint collection (over 40 shades! ), and I immediately clicked through to see it all. Now, I know I've only got 9 colors shown in the image above, but I seriously like all of the colors in their collection. These 9 just happened to be my favorites, but I would be happy to use any and all of them in my house. In fact, "Mushroom" is an extremely similar color to what we have in our guest room, and "Citrine" looks an awful lot like the color in our kitchen. I wouldn't mind painting "Punch" on the inside of our blue secretary for a surprise pop of color. And one of these days, I'd love to use "Steel" somewhere, anywhere in the house. Which, out of these 9, would you want to use in your own home? Wow, hope you are feeling better. The S & L colors are delicious. I am looking for a lighter version of mushroom, maybe dove. Thanks Kerry! I am feeling much better, thanks! Go for mushroom! It seems really dark, but it'll make any room seem like a Parisian getaway, I promise! Have a great weekend! Love this. I think i finally found the colors for the kid's playroom. Persimmon and pool. What do you think for a dark basement with no windows? Jules! Love that color combo! I would paint the walls in Pool and then add the color Persimmon in accent pieces or fabrics. Maybe a light fixture or lamp shade that's in Persimmon. You could also choose a rug where the main color is Persimmon or in throw pillows. But if you really wanted the walls to have both of those colors, I would suggest a statement wall of Persimmon. Or if you were really adventurous you could have some kind of pattern (or stripe) of the Persimmon with the Pool, kind of like this - http://pinterest.com/pin/72268768991614952/. So many options, the tough part is picking one!